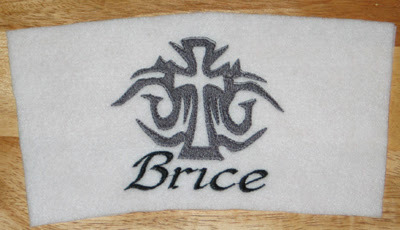 The first embroidery design we stitched on Kathy's swanky Brother embroidery machine was the monogram applique patch. 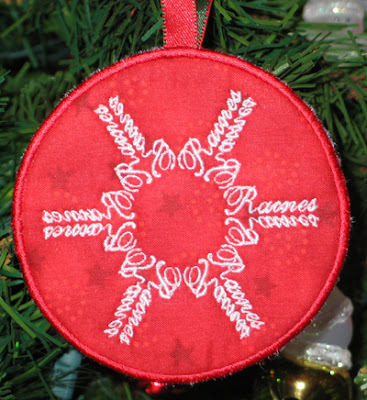 I used a monogram freebie posted on Sew Forum and used the oval envelop in Embird to make it circular looking. 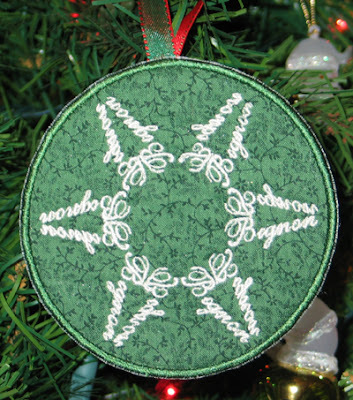 The circle applique design came from My Embroidery Haven's yahoo group. I was thrilled with how this dress turned out. And even more I love that it is two dresses in one! Hey, I just remembered that I can post this now! 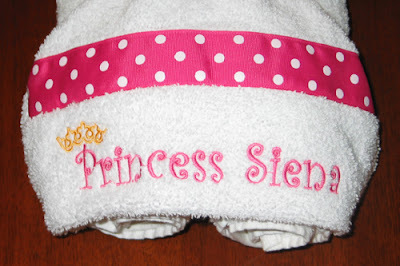 Early in December I made a hooded toddler towel that Stephanie had ordered for Siena, the daughter of mutual friends. 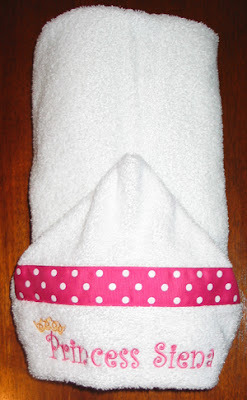 Before making this towel I attended a huge craft show where someone was selling hooded towels like these. They had figured out a great way to fold them so that the hood was visible, so I stole that idea. Fold in half lengthwise, roll toward the center and place hood on top. Makes for a nice presentation. This idea was not original to me. 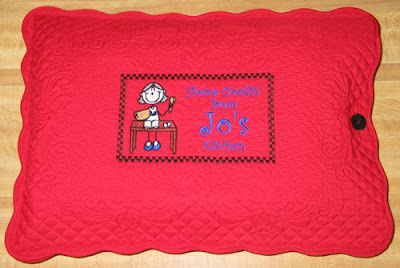 It has become quite the craze with stitchers on Sew Forum. Yes, I actually stitched on toilet paper. A member of SF posted a great tutorial which I followed. The red work design was posted on SF for a short time (no longer available) and I added the text with Embird Alphabet #22. 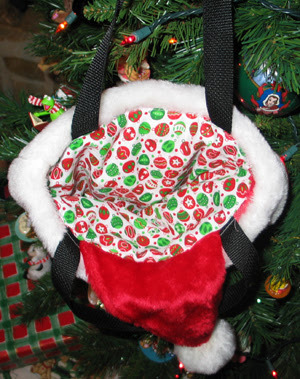 I opted to make our moms casserole carriers for Christmas. I got two pairs of quilted place mats from Wal-Mart. After stitching the embroidery designs, I added a buttonhole & button and stitched around 3 sides. They will serve as a decorative carrier to potlucks, an identifier for who made the yummy dish, and used as a hot pad underneath the pan as it's being served. They can accommodate up to a covered 9"x13" pan. First up is my mom's. 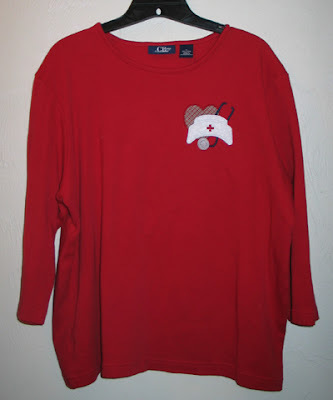 The design is from a set I got for free from Artistic Thread Works called Daily-Chore-Sticks Embroidery Design Set. The checkered border is a freebie from Embroidery Garden. I added the text with Embird Alphabet #17. 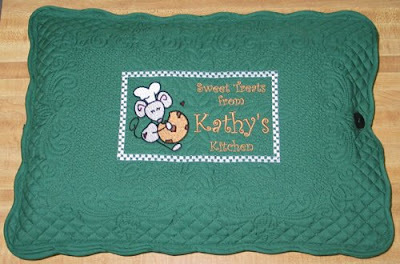 Kathy's design was also from ATW, a free sample of the Stick-Kitchen-Mice Embroidery Design Set. Harold, you're gonna love this, AND I MEAN IT! 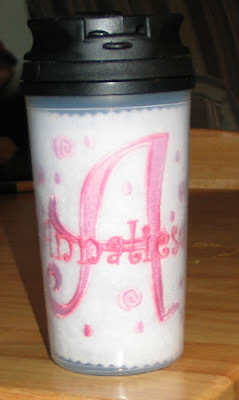 After successfully making several inserts for the Dollar Tree mugs, I decided to make one for my father-in-law Harold, but using the nice clear travel mugs available at Target. I found great fabric that looks like steam swirls on coffee-colored background. 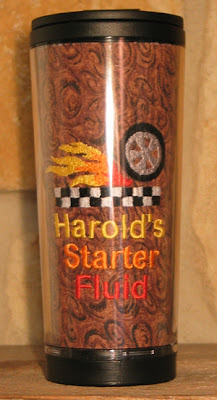 I searched Sew Forum for a design to go with my text "Harold's Starter Fluid" and found a car themed design that stitched perfectly. I was tickled pink. UNTIL I tried to put the insert in the silly cup. I had read from several other crafters that it was difficult to do with this mug, but it was nearly impossible!! It took me well over an hour. I was determined to get it in, but at 12:15AM I had to give up and finish the next morning. It was a battle of wills between me and the cup, and I won, but with casualties. The strategy that eventually worked (slowly but surely) was to use straight pins to push the embroidery under the lip of the clear plastic. I broke at least 7 straight pins doing it, and my index finger was sore for days! Once I healed, I determined it was worth the effort. And I'm pretty confident his enthusiasm this morning was genuine! As previously mentioned, my sister-in-law Amy has been making woven headbands this year. The amount that she has made and kept for herself has grown. 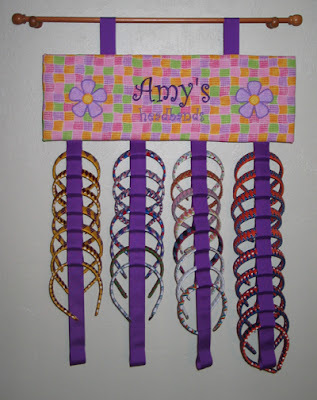 In September a member of Sew Forum posted a hairbow holder she had made, and I decided to extend her idea to make a headband holder for Amy for Christmas. Each ribbon has 12 slots to slip a headband through, so it can accommodate 48. I used 1.5" wide ribbon. I doubled the ribbon up and stitched across it every 2" to create little pockets to slip the headbands through. So for this particular holder I cut four pieces of ribbon about 52" long. Doubled it up and sewed 12 seams every 2". 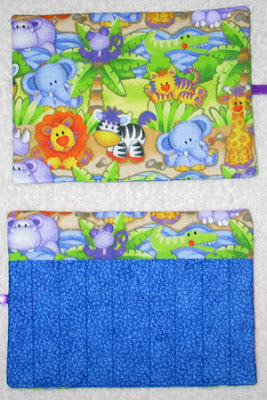 That created 48 pockets for headbands. For the top, I cut a piece of foam board 8"x24" and glued batting over it. I cut my fabric 10"x26" and did the embroidery. I added the text with Embird Alphabet #17. 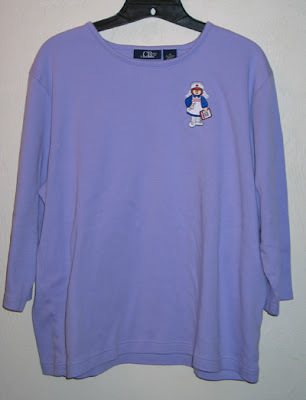 My only regret is that I wish I had used the dark purple thread for "headbands" too. Oh well... I didn't have enough time last night to start over. The applique flower was a freebie on Sew Forum and stitched beautifully. We also bought her a curtain rod/quilt holder for her to hang it from. The headbands overlap, so it doesn't hang flat. It really needs to be away from the wall to accommodate for that. Amy is hard to buy for, so I was really excited when I thought of this idea. She liked it, so it was a successful Christmas gift! Brice, my nearly 20-year old brother, is into music and Celtic stuff. I had nothing appropriate in my design stash, but thanks to lovely designers on Sew Forum, I found a couple to use relatively quickly! First is a travel mug insert. I used a tribal cross design and added his name with Embird Alphabet #33 (using an envelope to make it slanted). It was perfect -- he loved it! 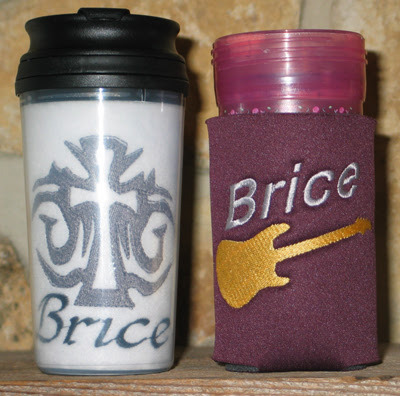 Second is a can koozie (ignore the Princess sippy cup... can you believe there isn't a pop can in our home??). I added his name with Embird Alphabet #2 (again in an envelope) to the guitar design. The card holder design came from Embroidery Garden (it's technically a Weigh In Book Holder). The design of the man with a camera was a freebie. I added the text with Embird Alphabet #2. 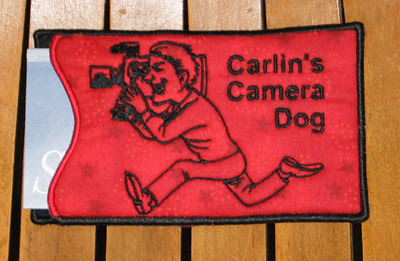 Someday soon that will be Carlin Trammel running with a new video camera! 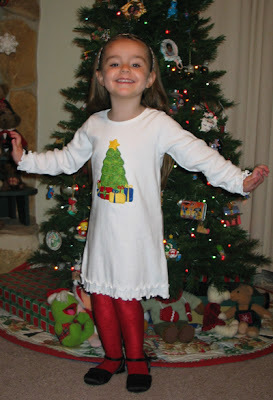 This weekend I finally got my shirt and Annaliese's dress done for Christmas. There are so many neat designs to choose from and so many other things to accomplish... that and the 80 degree heat we've been experiencing made it hard to motivate myself to make a long sleeved shirt and dress. But I got them accomplished, just in time for the cold front to hit this morning! 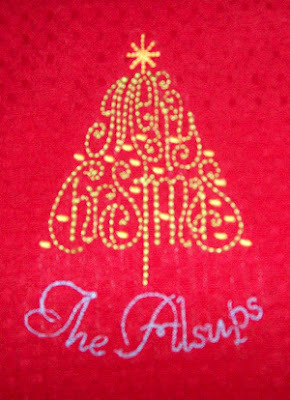 The design I settled on is an applique Christmas tree with gifts from Pegboard Crafts. Thursday night I found the perfect fabric for the tree (a fat quarter at Jo-Anns), and all the fabrics for the gifts were scraps from my stash. Annaliese's stitched out PERFECTLY, I used the small design on her dress (a long sleeve lettuce-edged dress from Dharma Trading). I used the medium-sized design on my shirt. There are a few places where the satin stitches don't cover the tack-down stitches, but I'm confident that was my fault. I was in a hurry and I think my shirt shifted ever so slightly in the hoop as I was trimming the fabrics. It's only noticeable up close, and later on I may try to find a way to hide it even better. Maybe after the holidays are over I'll stitch around the fabrics with my invisible thread and pick out the tack-down stitches... But there is no time for that now! I'm stitching Christmas gifts as I type. By the way, for my faithful readers, don't expect many more posts until Christmas afternoon. I am all done with orders (with the possible exception of a couple small things). Everything else I'll be making this week will be gifts for family. So if you don't hear from me again before then, Merry Christmas!! In November when I did the booth at Southwood, I met a couple pastors of the Good Samaritan congregation that meets down there. They were very interested in the crayon rolls and ordered fifty of them to put in their children's activity bags. I went on a search locally for Bible related fabric, and found that to be quite a challenge! I couldn't find any Noah's Ark fabric, or even appropriate nativity fabric this time of year. After consulting with Betsy, we settled on one that had cute phrases and a couple prints that had animals -- not Noah's Ark, but certainly God's creation. They turned out really cute! My machine has been working overtime... would you believe I bought most of the fabric Tuesday morning? 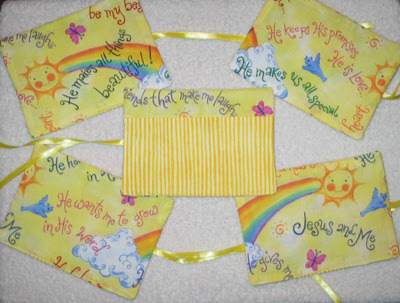 In addition to the crayon rolls, they also ordered 25 pacifier clips with "Jesus Loves Me" ribbon (like these)to use as gifts for new babies. It was a pleasure to fill this order, and I hope they are a blessing to the children who will discover them in their activity bags just before Christmas! It's his last name!! Now this idea is not original with me, but I did create this particular design. I asked Kathy to digitize Mullinax in a script font, and then I reflected and rotated appropriately to make the snowflake. 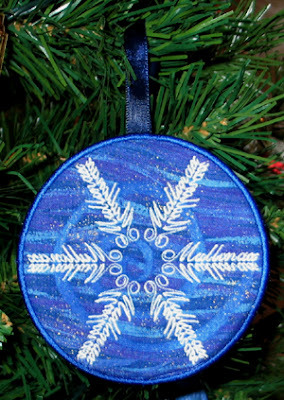 I found this fabulous blue swirly glittery fabric in my scraps -- it makes me think of a wintery wind blowing, not that anyone around here knows what that looks/feels like! I'm so pleased with how it turned out and can't wait to see everyone's expression as they discover the hidden design element! 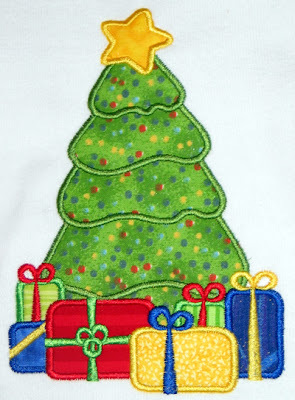 The Christmas Tree design came from Sew Forum, and I added the text with Embird Alphabet #22. 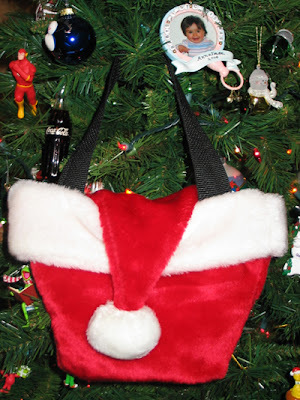 Here's another idea I got from fellow members of SewForum.com -- a purse made from a Santa Hat! It sounds pretty simple: cut the bottom half off and use that as the "closure", add handles and a lining. BUT this stuff is not easy to sew with! And trying to stitch across 3 layers of it was nearly impossible. I had to use my embroidery foot and feed it through myself. It was even too thick for my walking foot! It's one of the sloppiest things I've made, but thankfully it's all hidden underneath the white cuff. AND it's for a 3-year old... ;) I made this after Annaliese went to bed. I can't wait to give it to her tomorrow! I'll post pictures of her with it then. UPDATE: When Annaliese saw it, she said, "OOOHHHH, it's so cute!" 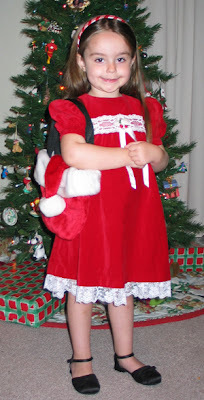 She liked it and got several compliments on it at church. 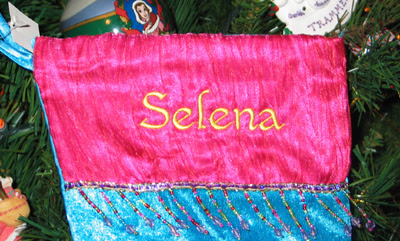 Ginny bought this cute bag and blanket set for her granddaughter, and asked me to monogram it. 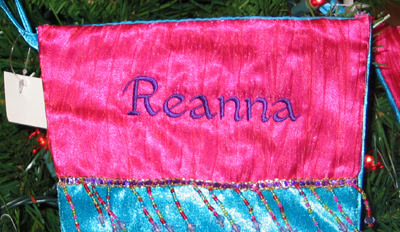 She didn't want the back of the embroidery to show on the reverse side, so I embroidered her name on an applique patch. I took an oval applique design and removed the last step of satin stitches. I used the first placement stitch as my tack-down stitch for the fabric, which I centered in my hoop. 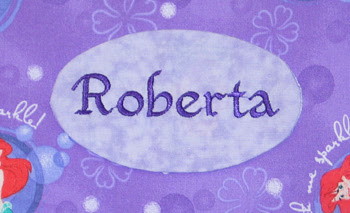 Next I stitched Roberta's name in the center of the oval. Then I laid a piece of fusible interfacing (fusible side down) on top of the embroidery and used the second tack-down stitch to secure it. I removed it from the hoop, trimmed to a quarter inch, cut a slit in the interfacing and inverted the patch. 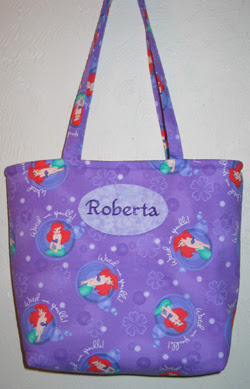 What I had was a fabric oval with finished edges, and a back ready to iron down to the bag or blanket. I ironed it in place and then sewed it down -- I used a blanket stitch (by machine) on the blanket and hand stitched it on the bag. 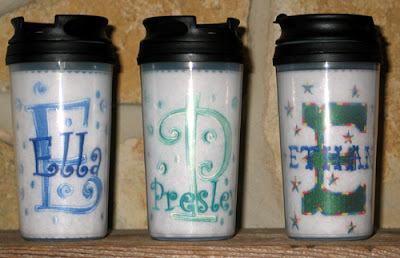 Following the craze that has hit SewForum.com, I've tried my hand at personalized travel mugs. This particular batch was purchased at Dollar Tree. They are only 11 oz, so they work pretty well for kids. I first made one for Annaliese. 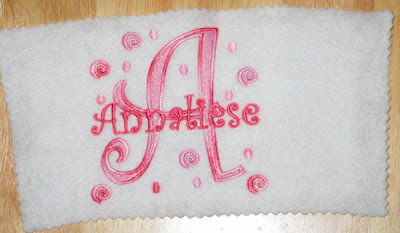 The large monogram was a freebie on SewForum, and I added her name with Embird Alphabet #17. 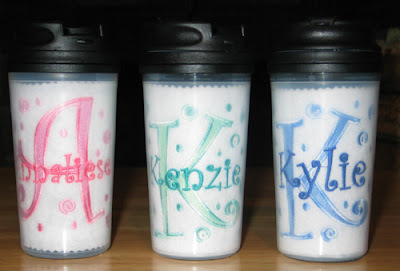 I decided I wanted another family to experiment with the cups before I started offering them, so I made a couple for Kylie and Kenzie. They were a thank you gift for hosting Thanksgiving, and then all our girls took them to Wild Adventures together. 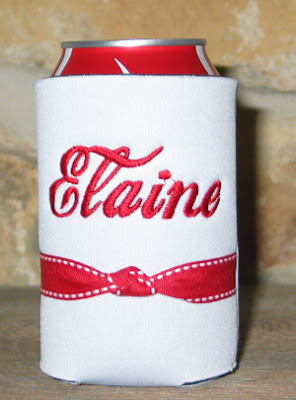 Ethan's monogram was also a freebie on Sew Forum. 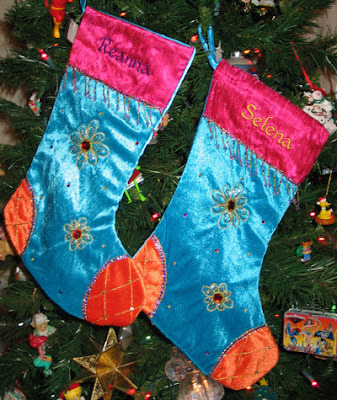 I enjoyed using variegated thread on each of them for the outline of the large letter and all the little embellishments -- it added an extra layer of interest! 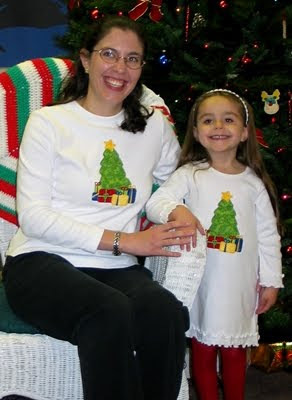 ...and I made a matching shirt for Sue. I added the text with Embird Alphabet #33. Sue has promised modeled pictures after graduation! 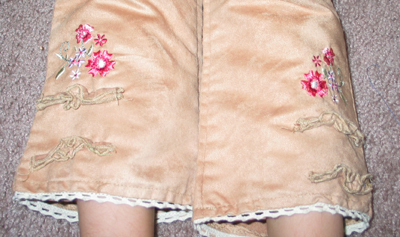 Since these pants were hand-me-downs and are on the brink of being too small, I tried my hand at embellishing pants. 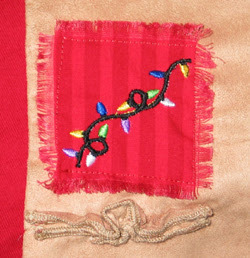 I embroidered the strand of lights design (from Embroidery Library) on red fabric and then stitched them onto the pants for form a patch. I left the edges raw and pulled out threads to make it fray. It turned out cuter than I expected! 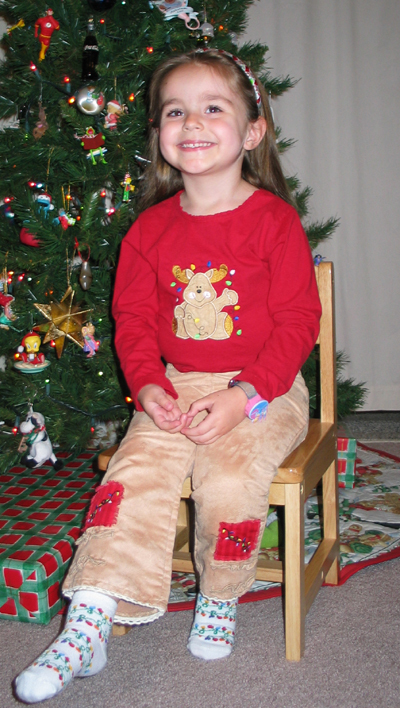 The headband, which I need to get a better picture of, has reindeers and Christmas lights, so it's matches really well! 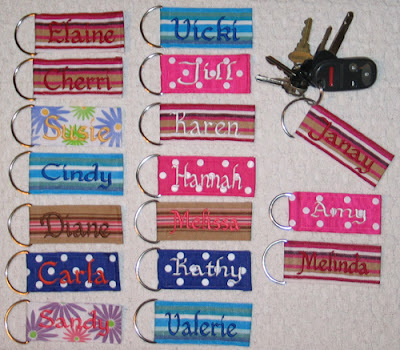 Ginny ordered 18 key chains to give as gifts to co-workers, friends and family. She gave me a list of names and suggested a color for each one. I went shopping for ribbon and picked thread colors from my stash. 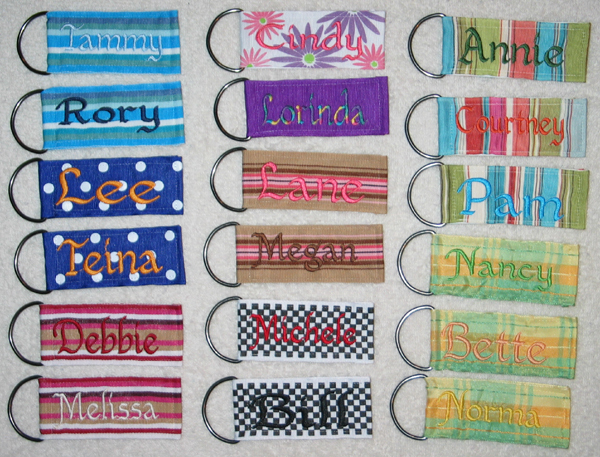 I made these in assembly-line fashion: digitized all the names first, embroidered all the ribbons (4 per hooping), trimmed down stabilizer, cut ribbon to size, then stitched ribbon to D-ring. I used clear monofilament thread to stitch the key chains closed so I didn't have to change thread (both top and bobbin) 18 times! I was pleased with the results -- hopefully all the recipients will be, too. Leslie requested a baby girl gift set similar to the set I did for Kristen a while back. 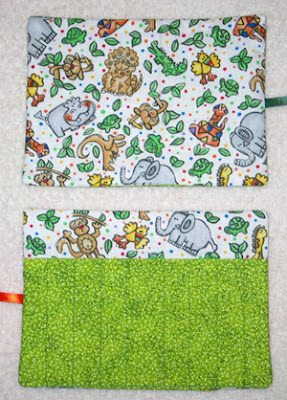 Here's a matching onesie/bib/burp cloth set for little Anila! 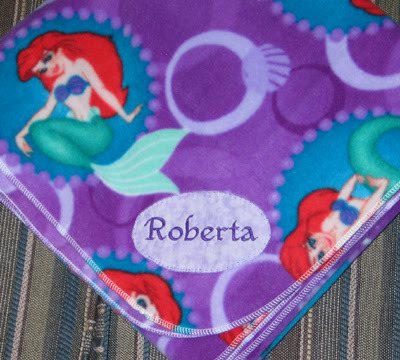 The monogram on the burp cloth is from the Dot Alphabet I got on Sew Forum. Kathy digitized the name for me using the font Acadian. The dot frame on the bib and onesie is also a design I got from Sew Forum. 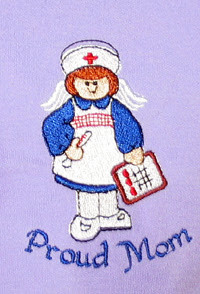 The monogram on the onesie was added using Embird Alphabet #17. Today is our preschool director's birthday. 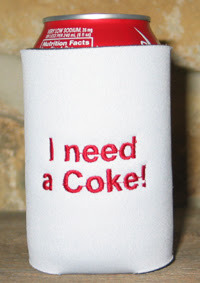 I work with her in the office, and every morning around 10am she has to have her daily can of coke. So I made this for her. 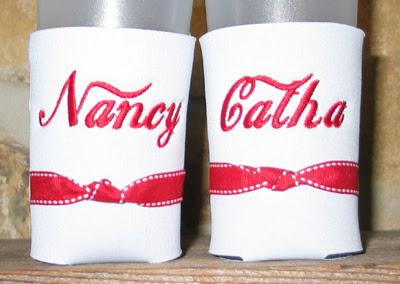 Kathy digitized her name with Font Engine and a cola font. I did the back with Embird Alpha #2. She LOVED it, and I already have orders for two more! 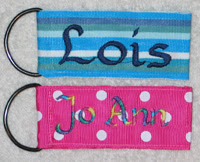 Here are the two that I did for Carol to give as gifts (the backs are the same as Elaine's).